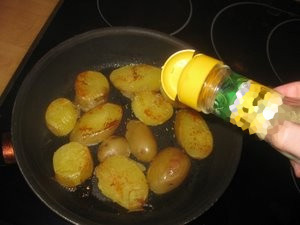 If you don't have the new potatoes then you need too peel it, but i suggest you to use the new potatoes as it will taste way better. 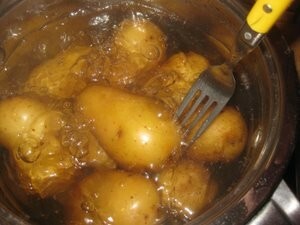 Put the potatoes in the cooking pot filled with water and set the highest possible temperature. After a couple of minutes add a few pinches of salt. 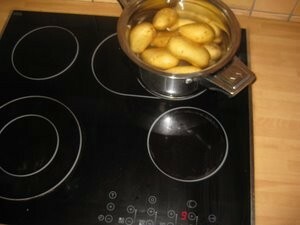 When the water starts to boil, you can reduce the gas or the cooking plate temperature. 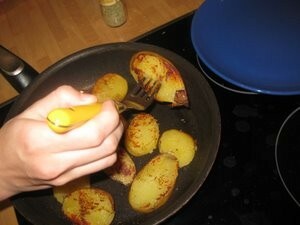 Wait about 25 minutes and use a fork to check if the potatoes are ready. 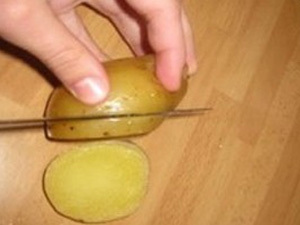 Use the fork to pierce the potato. It should be soft and fork should slide in fairly easy. Drain the water out of the pot. 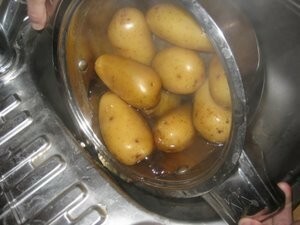 You can use cold water to cool the potatoes a bit, but only a bit. Take the potato and slice it across. 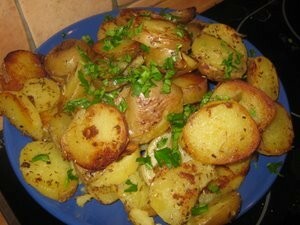 Do that with all the potatoes. Take the frying pan and set the highest temperature possible. 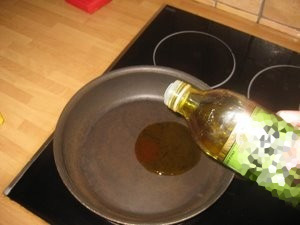 Add two spoons of olive oil. 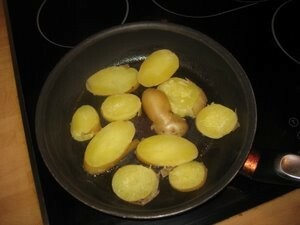 Before the oil start to smoke add the young potato slices into the frying pan. The slices shouldn't overlap for the optimal result. 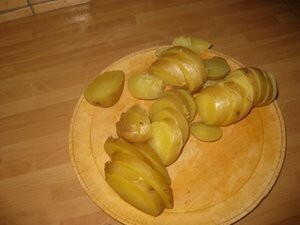 After a couple of minutes turn over the potato slices. Add a few pinches of rosemary and a pinch or two of salt. 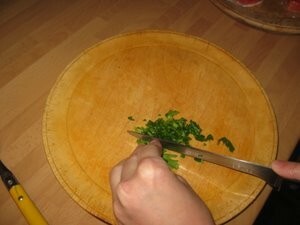 When the slice are done use a fork, spatula or simply slide em onto a plate. 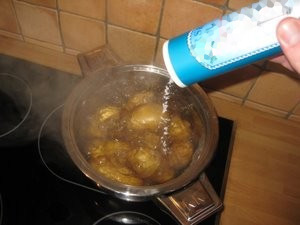 ... and sprinkle it over the potatoes. That's it enjoy your very own new baked potatoes (presumably) the Tuscany way. Nice. I ate that with my father once in a restaurant and it was delicious. It's great with grilled turkey. It's like chips and I would not boil it too long and also make thinner pieces.